There's a lot more to Wadi Khabb Shamsi than that amazingly deep, narrow gorge. Here's how to sample the hidden delights above Wadi Khabb Shamsi. For a bit of background, take a look at Wadi Secrets first. Round-trip: - Really depends on what you do from the top of the staircase. We spent 5 hours in exploring and climbing the un-named Jebel. Difficulty: - Generally easy walking. Some rough paths and goat / donkey tracks. Chirri dog factor: - Easy. Plenty of animal tracks and scents to follow. A few donkeys and goats to chase. I've been wondering what the lizards taste like. Not too sure about meeting a leopard though. Dangers: - Take care in canyon and make sure it isn't about to rain or your car will be gone when you get back!! Wildlife and plants: - Plenty to interest botanists and birders. Navigation: Follow the tracks made by the locals. The staircase we used was at 25° 46.581 N 56° 15.550 E (459m) - thanks to John Kirk for telling me about this. There is only a small area for parking cars at the foot of the staircase perhaps room for 3 or 4 by the water tank. We camped nearby, at the top of a road which services some villages on the other, inland side, of the road 25° 46.687 N 56° 14.834 E (584m). To find the staircase, zero your odometer at the wrecked Toyota chassis. 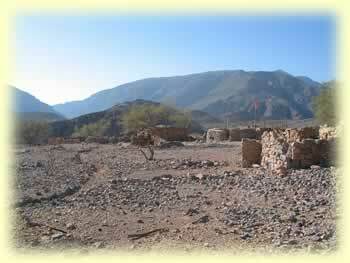 This is near the village, at the foot of the descent from the mountain pass at Aqabat Oso, and on the way to Dibba. From the wreck it is approximately 4.1km. Look out for a water tank on your right which is situated up against the cliffs beside the road. Here the wadi runs below the road on the left. The staircase can clearly be seen on the other side of the wadi. You could also camp at the top of the pass at Aqabat Oso, or on the beach at Dibba or Zaghi. A nice place with a great view would be in the small clearing at the top of the road to Zaghi. If you fancy carrying all your gear then take lightweight equipment so you can split the hike across two days and extend your range of exploration. On our trip, we drove to the start of the staircase after breakfast and spent four or five hours hiking. At the top of the staircase is quite a large farm at about 560m. When we visited, the Pakistani caretaker, accompanied us up there and showed us around. We saw the family graveyard, the water cistern, the tandoor style ovens, and were given a tour of his accommodation; no electricity or air-conditioning, but peaceful, and a great view. He even offered to make us some tea despite the fact that it was Ramadan and he was fasting. If you visit, then a gift of clothes or shoes that you no longer need, or some food, would be very well received. This guy was very friendly and welcoming, and would really appreciate your generosity. It's well worth spending the time talking to people in the mountains. Even if there is a language barrier at least make contact and shake hands. Sometimes local people are suspicious of foreigners and it really helps if you break the ice a little. In their culture there is a natural tendancy towards being hospitable to visitors but you have to be receptive. From the farm there is plenty to explore. We made for a high-point, climbing the ridge just behing the caretaker's house. Up there is a small man-made structure and you get a good view of your surroundings. Look out for the channels which have been built to direct water from the winter rains directly down to the farm. From this point you can choose from various options. Head over to one of the peaks nearer the coast, head north and explore the ridges to the east of Aqabat Oso, head south and visit the string of settlements dotted around the valleys, or if you have time head over to the coast. On our trip we climbed a peak (25° 47.786 N 56° 15.823 E (1082m)) to the north east of the farm and enjoyed amazing panoramic views over the surrounding hills. There are many possibilities up there and it's well worth a visit.